Milan-based company producing liquors founded by Bernardino Branca, inventor of Fernet-Branca, in 1845. In 1893 Leopold Metlicovitz draws the "World" Branca: the edition, which is represented an eagle grasping the globe, states around the world as the iconic image of the company. 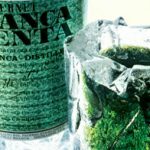 In 1963 born Fernet-Branca mint that will go down in history as Brancamenta.